Structural monitoring company Weir-Jones has released a new version of its automatic draft indicator system, or ADIS Version 7, which sends information on a vessel’s trim to Android and Apple smart devices in real time, cutting down on how long it normally takes to relay that information and allowing remote access of those data. The Weir-Jones automatic draft indicator provides real-time displays for smart devices, specifying draft and freeboard at various hull locations and also the vessel’s trim. The intention of this effort is to allow the person in charge of ensuring a vessel’s safety to be “in a better position to make safety-related decisions on the fly as it’s happening in real time,” he said. Real time is important to ADIS customer Capt. Bill Hughes of Washington State Ferries. Each of his vessels has to be weighed before it can leave port, per Coast Guard parameters. But that weight constantly shifts as passengers load their cars onto the ships. Hughes has to balance putting as many customers on board as is safe while making sure his boats aren’t too heavy. In addition, time is of the essence to those on board the ferries, Hughes said. “When we’re looking at the regulation enforcement part of it, if we have some issues happening on some vessels where there are failures happening of some sort, it takes about five to seven minutes each trip (to assess them),” said Hughes. “And if you multiply that out … some of our runs have 28 to 30 departures a day. And a run has got a 15-minute crossing, and you have a half-hour turnaround. 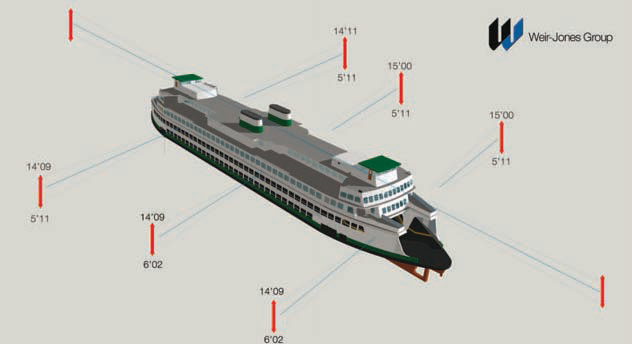 Before Washington State Ferries began using ADIS about 10 years ago, Hughes said the weigh-in task was manual. His company uses a version of ADIS that Weir-Jones modified for the company that provides pre-load notifications, so he’ll know if a vessel is getting close to the over mark. 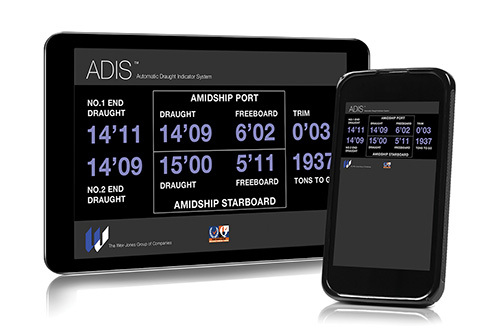 ADIS’ Virtual Ship feature displays the vessel’s draft calculations at a glance, in real time. He envisions the smart device process will refine the system further, especially cutting down on response time to problems. In addition to cutting down on time, ADIS can offer its users a cost savings. The system can interface with ballast control systems so water can move through the ship’s ballast tanks, balancing it to keep it at optimal trim, thereby optimizing fuel efficiency. “You can manipulate your loads, if they are not full loads, to best maximize vessel efficiency of hull shape by distributing the weight among it so you don’t have any hogging or sagging, or are heavy on one end or don’t have the most efficient profile, and that can actually save fuel for the vessels,” said Hughes. The wireless features of the system work over a multitude of network solutions, including radio link, shipboard Wi-Fi or a cellular network. The system uses a series of ultrasonic sensors to monitor the ship from multiple locations. The transceivers and a data buffer repeatedly feed positioning data through an algorithm that calculates how far that sensor is from the water line. Since the sensors are spread throughout the vessel, the average of those data can show a master how the ship is sitting in the water plane. ADIS can be used in virtually any conditions and in any kind of water, says Bodner, but to be effective, the transceivers have to be placed to cut down on saturation runoff, optimally no more than 40 or 50 feet above the water line. In the future, Bodner says he envisions an ADIS system that is turnkey for newbuilds.